A schematic approach is designed to stimulate children through various interactive sessions & activities. We believe in an education system which is child centered & helps in overall development of the personality. We at Alma Mater don’t believe in rote learning but in brain target teaching. Latest educational technologies like audio-visual aids, smart classes, computer aided learning, english communication labs, etc. ensure it. To nurture innate talent & overall development of personality co-curricular & vocational activities like Dance, Music, Aerobics, etc. are offered to Almaterians. A Day Boarding school is like a second home for its students. 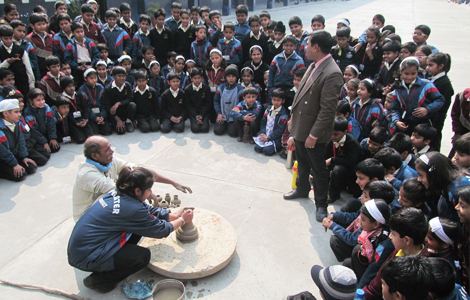 Thus, care is taken to make the day comfortable & interesting for the students. There are hi-tech classrooms which provide e-learning through e-teaching. The English lab helps in creating a favorable environment making English the mandatory campus language. It is ensured that the academic work is completed at school with the help of revision sessions/classes. 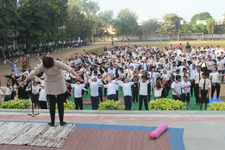 Activities like Yoga, Swimming, Aerobics and Skating, etc. provide a creative outlet for the energy & talent of growing children. The food provided here is a balanced diet directed by a dietician. It also helps in developing good eating habits.